The word processor from Google Docs lacks a sorting feature for tables, but Firefox users can try an extension that adds the missing feature. Install TableTools, the best extension for managing tables, restart the browser and open the document that includes tables. To use the extension, you need to right-click on the table and select one of the available options: sorting, filtering, copying data as tab-delimited text or as HTML. Google Docs replaces Firefox's contextual menu, so it's necessary to press Shift + Right-click in order to bring back the original menu. 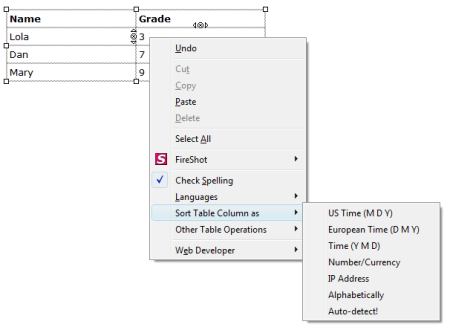 Select from the menu "Sort table column as" and choose the appropriate data type. If you want to copy a table from Google Docs to Google Spreadsheets, select the cells, choose from the contextual menu: "Other table operations < Copy as tab-delimited text", and paste the text in a spreadsheet using Ctrl+V. Unfortunately, the filtering feature from TableTools doesn't work in a rich-text editor, but it's very useful if you visit a web page that includes long tables. Sweet, this will save me a lot of headaches in the future. Looks to be called TableTools2 now. Is there a table tools for Google Chrome?